No Comments on FDA Approved Antibacterial Wipes Now Available From Glaro Inc. This month, Glaro Inc. has released “Expanded Use” antibacterial wipes. Strong enough to kill tough germs and safe enough to use on hands, Glaro Inc. wet wipes are among the most effective, versatile wipes available. Glaro antibacterial wipes kill germs fast and remove dust and grime. In fifteen seconds, almost all germs are destroyed. Glaro wipes are versatile. For almost any public or private facility, our wipes are the ideal solution for cleaning and sanitization. Facility managers at gyms, supermarkets, daycare centers and schools, medical buildings, offices, car rental agencies and nursing homes, for example, will meet customer needs with the convenient use of our wipes. Safe for surfaces and hands. Our 8” by 6”wipes have been specifically formulated for use on objects and on our own hands. It’s safe to use them, because the formula is strong enough to sanitize surfaces but gentle enough to use on your hands. The wipes rolls are conveniently packed in two sizes: in double packs (2 rolls of 900 per box), or in four packs (4 rolls of 900 per box). 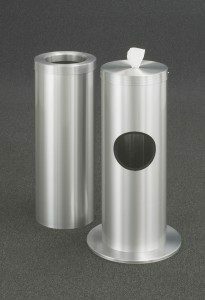 With Glaro Inc.’s wipes dispensers (sold separately) and waste receptacles, you will have everything you need. Replacement wipes are also available for refills.